This entry was posted in Quadrotor, Robotics and tagged Drone, filming, sport on February 20, 2014 by enddl22. 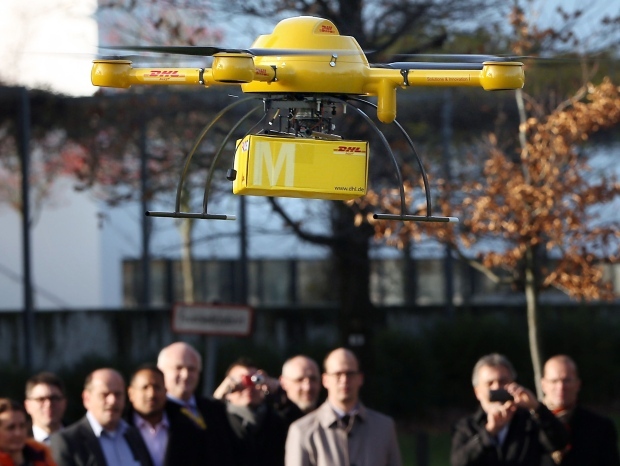 Delivery my parcel using a drone? Just kidding, isn’t it? I have seen many videos, using a drone delivery parcel recently. It stems from Amazon’s Prime Air and DHL delivery service. And then other start-up companies such as MikroKopter and Asctending technology released their videos with a title Christmas gifts delivery. Isn’t it just for joking and nothing serious ha? If you plan to deliver a book to a place 12Km far way, a chopper, couple of automobiles may be required. It is quite difficult to see possibility in near future to do this, (especially when a drone completely disappears line-of-sight), it is good to advertise UAV, MAV, UAS whatever to public. This entry was posted in Quadrotor, Robotics and tagged Amazon, Delivery, Drone on December 19, 2013 by enddl22.